"Where Everyone Can Get Involved!" What is IM REC? IM REC stands for Intramural and Recreation. 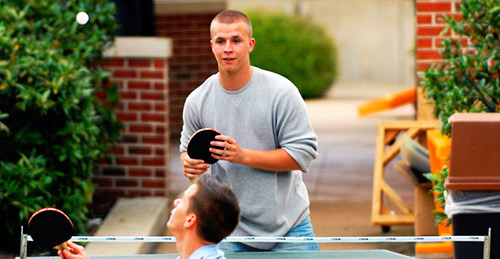 The IM REC department offers students the opportunity to live active and meaningful lives while on campus. We strive to offer traditional sports as well as to introduce new activities and events to our students, faculty and staff. Some of these special events involve student versus faculty/staff softball games and basketball games, and a strongman competition. We also have traditional leagues and tournaments which include: flag football, ping-pong, basketball, sand volleyball, indoor soccer, darts, golf, racquetball, bowling, horseshoes, and 3-point shoot-out. Chattanooga’s location in the Tennessee Valley provides access to premiere outdoor recreational activities. 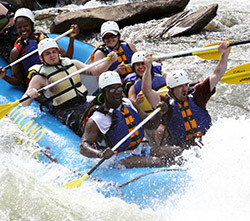 Hiking, boulder climbing, white-water rafting, mountain biking, and caving are among many outdoor activities offered. IM REC takes trips to Six Flags, professional sporting events, paintball challenges, and more. We aim to bring people together. We offer special pricing to our students, faculty and staff. We also extend special pricing to friends and family members of ChattState students, so they can join us and add to the fun and enhance your college experience. When you are on Campus, IM REC offers a wide variety of activities that are available for you to take a brain break and get involved. Sometimes just taking a minute and trying something new, whether it be playing, relaxing, or exercising, can improve your day! Our outdoor recreation program is growing fast. What a great city Chattanooga is, and our college is right on the Tennessee River! So, it is easy, convenient and beautiful to enjoy the nature all around us. IM REC rolls down the river on bikes, canoes and kayaks. Join us!